Fight for a Court that speaks of and for the rest of us. In 2012, progressives are on the defensive, and the battles over the meaning and purpose of the law and the Constitution are being fought largely on conservatives’ political and linguistic turf. The power of ordinary people to band together through labor unions and class-action lawsuits is being steadily weakened as corporate prerogatives are strengthened. As Craig Becker and Judith Scott show on page 27, access to the courts is being steadily limited by decisions that undermine class-action suits or force disputes into arbitration, a playing field that favors business malefactors. As Jamie Raskin writes on page 17, after the Citizens United decision, an unprecedented torrent of corporate money has flooded the political system, distorting democratic processes and institutions. And perhaps most ominous, if one carefully reads the tea leaves from the Court’s recent decision on the Affordable Care Act, it appears that the commerce and spending clauses may soon be weakened as a constitutional framework for reining in corporate malfeasance. Although Chief Justice John Roberts wrote the opinion upholding the individual mandate as a “tax,” he went out of his way to explain why the mandate could not be upheld under the commerce clause. It is clear from the joint dissent that there are four other votes for this restrictive and retrogressive view of the commerce clause. The implications are potentially enormous for the government’s ability to address problems of national significance on every front—the environment, civil rights, labor rights and beyond. Simultaneously, as Justice Ruth Bader Ginsburg pointed out in her opinion, in narrowing the law’s Medicaid provisions, the Court, for “the first time ever,” has found a Congressional exercise of the spending power to be unconstitutionally coercive. The Court, including some of the so-called moderate justices, has clearly opened the door to future challenges to Congress’s ability to attach conditions to the grants it makes to the states. A host of social welfare programs and anti-discrimination statutes could now be at risk. So, while many progressives hailed the Court’s decision to uphold the healthcare law, it is important to recognize that the opinion is based on decidedly conservative and pro-business principles with lasting implications. To do this, progressives need to place greater emphasis on taking back the judiciary. That means developing a narrative, a down-to-earth way to talk to people about the courts and their importance in our daily lives. 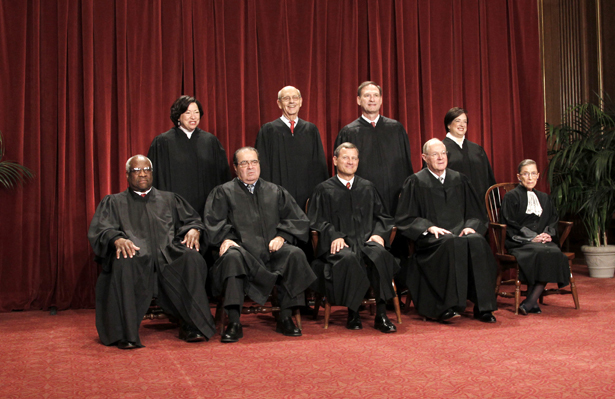 For years, conservatives have aroused their base with rhetoric about “activist liberal judges” who are “legislating from the bench.” This well-financed and well-focused campaign led to a Supreme Court dominated by conservatives, which—as the articles in this issue demonstrate—is busily “legislating from the bench.” Progressives should support political action that will bring about the nomination of judges who understand the concerns of everyday Americans. § A much more aggressive approach to judicial nominations. Much more attention needs to be paid to building a cadre of young progressive lawyers and law teachers who can serve as a reservoir of talent for future judicial appointments. We need to build a bench for the bench. Simultaneously, lawyers, law professors, students, activists and legal commentators need to become significantly more active in monitoring the judicial nominations process and putting pressure on home-state senators and the White House to move that process forward. We should put forward progressive nominees who are equipped to go toe-to-toe with conservative jurists. As Sherrilyn Ifill writes on page 31, we need judges from more diverse professional backgrounds on the federal bench. There has to be room for jurists who have had public interest, civil rights or criminal defense careers, or those from the academy who are prepared to fight a battle of ideas. In an era in which confirmation fights have become a full-contact sport, it may seem easier to take the path of least resistance. But progressives should not unilaterally disarm, even if the inevitable nomination battles are hard fought. More victories would be won if progressive activists, voters, organizations and funders truly understood that these are battles that must be fought—and communicated this to their elected officials. § Smarter political tactics for influencing the Senate. Democrats voted to confirm 97 percent of George W. Bush’s district court nominees during his first term, many of them ultraconservatives, but never had to pay a political price. And during the current term, there was no outrage from constituents demanding to know why Democrats didn’t work harder to confirm Goodwin Liu, who had stellar academic and professional qualifications to serve on a federal appeals court. We need to do a better job of holding senators—even friendly ones—to account when they vote against our interests. We need to cultivate and support assertive champions of a progressive judiciary in the tradition of the late Ted Kennedy. Finally, while progressives are inevitably stretched thin by an onslaught of issues and limited resources, activists and opinion leaders must make the courts a central issue. The message is simple: everything we’ve fought for, everything we care about, everything we’ve won, will be taken away by hostile justices and judges if we don’t step up. Conservatives know that Supreme Court decisions are great mobilizing and fundraising tools because their base cares deeply about them. As a result, conservative politicians feel emboldened to make courts and judges into political issues, and to talk about the law and the courts as both symbols and instruments of power. Until this is equally true on the left, it will be a one-sided fight. Funders of progressive action need to play the same long-term game. Individuals and foundations could perform a singularly helpful role by bankrolling legal scholarship and the training of judges; by supporting advocacy at the national and state levels; by focusing on judicial nominations; and by contributing to the development of a progressive constitutional message expressed in terms that have broad public appeal. Another place to start would be the establishment of a deeper pool of resources for progressive litigation. Think of it as a liberal counterweight to the National Chamber Litigation Center. Today, there are several organizations that run prestigious litigation programs in consumer rights, the environment, and civil and human rights. It’s time to explore ways of pumping funds into these groups and giving them the financial and legal stamina to fight the kinds of decades-long battles that the NCLC was set up to fight on behalf of business interests. Most important, mounting a campaign to educate Americans about the courts will take significant financial support. Most people are unaware that court decisions affect almost every aspect of their lives. Focus groups conducted by Alliance for Justice reveal that most of the public has no idea how many justices sit on the Supreme Court, and few are able to name any of them. Americans are simply not tuned in to the fact that judges and justices have lifetime appointments, and thereby can have a much more lasting impact on the country than anyone else named to office by the president. A vastly enhanced progressive engagement will be required to raise the public awareness necessary to counter the conservative juggernaut. Progressives need to take back the message. While we have some brilliant thinkers contributing a progressive view of the law, we need to develop simple terms that have public appeal. For instance, when we talk about the threats posed to Americans by the Roberts Court, we ought to focus on concepts like fairness and balance, as well as the threats to individual liberty from unchecked corporate power and a few massively wealthy individuals. § Being critical of the Court when criticism is warranted. As I talk to people around the country, I often encounter a reluctance to take on the Supreme Court directly. Progressives of a certain age established their view of it in the heady days of the Warren and Burger Courts, but this is a trap. We need to frame the debate over the Court’s actions as a battle between those who want to turn back the clock, culturally and economically, to the days before the New Deal, and those who want to build a just and diverse twenty-first-century society. When Justice Antonin Scalia tells Chris Wallace on Fox News that the right to bear arms just might include “handheld rocket launchers,” it’s time to be more assertive in making the Court a talking point in the national dialogue. It’s a vastly different game today, and it’s being played out in courtrooms across the country, led by conservative interest groups and think tanks, corporations, right-wing funders, and Republican governors and attorneys general. They know they can undo seventy-five years of progressive legal principles by shepherding laws—one by one, case by case—to the front door of the Supreme Court, where their ideological confrères are waiting to weaken or eliminate them. Progressives have a well-established philosophy of law rooted in the core American and constitutional values of equality, justice, freedom, fairness, community and opportunity. We need to recapture the conversation with assertive statements of our beliefs, while not hesitating to be respectfully but forcefully critical of those justices and judges who ally themselves repeatedly with the 1 percent. We need a coordinated effort to close the political intensity gap between the left and the right. Those of us who fear that decades of social progress will be undone in the span of a few Supreme Court terms need to persuade progressive voters, activists and citizens of all stripes that the courts truly matter, and that they should hold their elected officials accountable for restoring balance to the courts so that all Americans, regardless of income or influence, can find the justice promised to them in our Constitution.